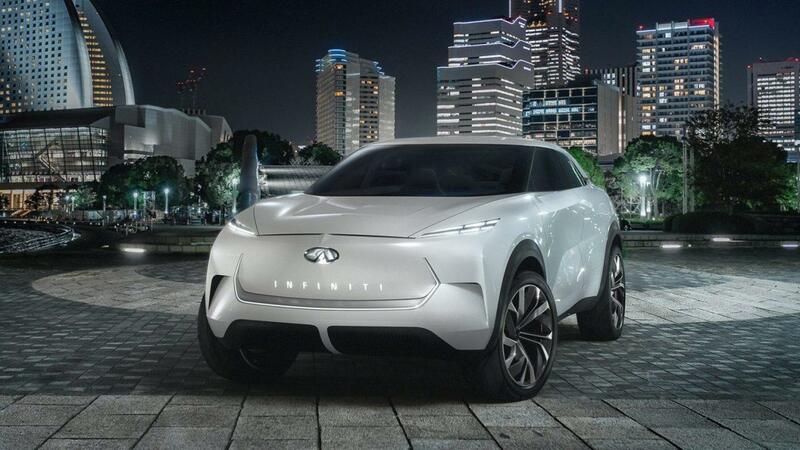 The Infiniti QX Inspiration, an all-electric concept car. People heading to the North American International Auto Show will be able to see some ready- or nearly -ready-to-buy cars, as well as concepts. Some of the concepts are electrics. Car companies say electrification is likely to significantly change how cars look both inside and outside. Karim Habib is executive design director for Infiniti, which is showing a concept electric car, the QX Inspiration, at the show. He says electric cars don't have big engines in the front. That's because batteries, typically underneath, power the car. "So we take that room that was taken by the engine, we give it back to the customer." He says that creates more of a lounge-like feel inside. No engine means you move something else to free up space inside. "One of the things you have inside the car that takes a lot of room is the HVAC, the air conditioning and heating system. It's always in the front and is actually quite big, and by taking that and putting it where the engine usually is, you're able to free up a lot of space in front." Besides a roomier inside, electric cars don't need grilles as part of the outside design, because there is no engine to cool with air coming through the grille. So Infiniti's concept at the show is designed with no grille. General Motors CEO Mary Barra says the automaker is fully committed to a zero emissions future. Those vehicles of the future are being developed using the profits from GM's gasoline-powered trucks, SUVs, and crossovers.